I would wager this has been talked aout before but as I am fairly new I thought I would ask what are ya'lls thought on these mysteries of JPII. I actually like them and see no problem in them. What say you? I love the Luminous mysteries. I just don't pray them as a part of the traditional weekly cycle of the mysteries. If I have time or desire to do an extra rosary during the day, I will usually do the Luminous mysteries. I'm quite fond of the mysteries of the Transfiguration and the Institution of the Eucharist, so I'm usually pretty excited to meditate on them. Love the luminous mysteries they are part of my normal rotation. (04-11-2019, 10:25 PM)Eddo36 Wrote: I would wager this has been talked aout before but as I am fairly new I thought I would ask what are ya'lls thought on these mysteries of JPII. I actually like them and see no problem in them. What say you? I think they are just a silly novelty that is part of the craziness that seems to define the post-conciliar period. The rosary was fine the way it was. Sometimes, I like praying it, and sometimes I don’t. Having five new mysteries to think about while praying it doesn’t make me want to pray it when I already don’t want to pray it. 1. They seem to be an unnecessary novelty. Why the need for a Rosary Mystery secret decoder ring? On a personal note, on the first Saturday of the month I attend a Novus Ordo Rosary group for families that are suffering from addiction. So I pray the Glorious at home and the Joyful at the group. The bad news the two schemes breaks unity, the good news is I pray an extra rosary. 3. There is much historical Catholic Art and Classical Music written about the 15 mysteries of the Rosary, does that need to be redone now? Does Marty Haugen need to add the Luminous Mysteries to Biber's Rosary Sonatas? Perhaps let the abstract artists that came up with the horrendous Year of Mercy logo add to Fra Angelico's pictures of the rosary mysteries. 4. Books? Do we let the likes of Father James Martin update St Louis de Montfort's "The Secret of the Rosary"? Granted some of my examples above seem extreme, but in the church these days who knows. Things seem to be way out of control. Catholicism is not just a religion it is a way of life. Vatican II, intentionally or not, seems to breaks that down on every level possible. Adding New Mysteries to the Rosary does the same. Paul VI did not let Bugnini mess with the Rosary; why did St John Paul II feel the need? In the end, for a personal devotion, they seem fine. Then again, why mess with a great thing? "There are in truth three states of the converted: the beginning, the middle and the perfection. In the beginning, they experience the charms of sweetness; in the middle, the contests of temptation; and in the end, the fullness of perfection." I agree with this. Fr. Donald Calloway explains that they actually pre-date Vatican II. They were invented by a man named St. George Preca. Like others have said, I like the luminous mysteries I just don’t include them in my rotation. If I do an extra one it may be the luminous. But I haven’t done a luminous mysteries in a long time. Most time I’ll do a st Michael chaplet or a st Joseph rosary. I don’t think they’re a novelty. That’s dishonest about their origin. JP2 didn’t develop them, they’ve been around for a long time. They were just never included in the rotation. If you're praying the whole Rosary, they mess up the parallel to the Psalms (unless you drop another set)--it being Mary's Psalter is the true substance of the Rosary--so much so, Bl. Alan de Rupe himself was staunchly against praying only 50 a day or even calling it "Rosary." If you're just doing 50 a day, then you've got two full Psalters and an "extra" 50 each week. I see less of an issue then, especially since the Luminous Mysteries themselves oppose some chief errors of the (strictly so called) Modernists. I can see why some like them and some don't, but I don't think it should be some high priority point of dispute. After Jesus Christ was baptized in the Jordan, he was led into the desert. Jesus reveals Himself as true God by word and by miracles. Jesus teaches the Beatitudes on the mountain. Jesus is transfigured on the mountain. Jesus has His final supper with the Apostles. (04-12-2019, 09:10 AM)SaintSebastian Wrote: After Jesus Christ was baptized in the Jordan, he was led into the desert. "When one lives by novelty, there will always have to be a new novelty." I consider it tragic. JP II just could not leave well-enough alone. There is literally nothing that neo Catholics could just not keep their hands off after Vatican II. Everything had to be "updated" and "improved. " I cannot tell you much this personally infuriates me. Part of the confidence of the Catholic Faith is that its worship and devotions do not change. With the world constantly changing around us so rapidly we cannot get a sure footing, having a bedrock of Catholicism that is the same yesterday, today, and tomorrow is comforting and a source of strength. I particularly find it cruel, yes cruel, when things like this are done by supposed Shepherds. this subversive. It was one of the last devotional things left all Catholics had left in common, untouched. Our Lady had attached 15 blessings to the specific corresponding 15 mysteries. Now to pray the full rosary, according to him and those who follow him, one would have to pray 20 mysteries and 1/3 turns into 6.66. Probably just a coincidence. The 150 mysteries of the Rosary given to us by Our Lady corresponds to the 150 Psalms of the Old testament. There are not 200 Psalms in the Old Testament. We can see, therefore, that in many important apparitions, Our Lady asks Catholics to pray the Rosary as we always knew it – the Creed, the introductory Our Father, three Hail Marys, and Glory be; and the body of 150 Hail Marys, 15 Our Fathers, and 15 Glory bes divided into three sets of five mysteries, the Joyful, Sorrowful and Glorious. It seems quite clear that the innovation of John Paul II is opposed to the expressed will of Our Lady. 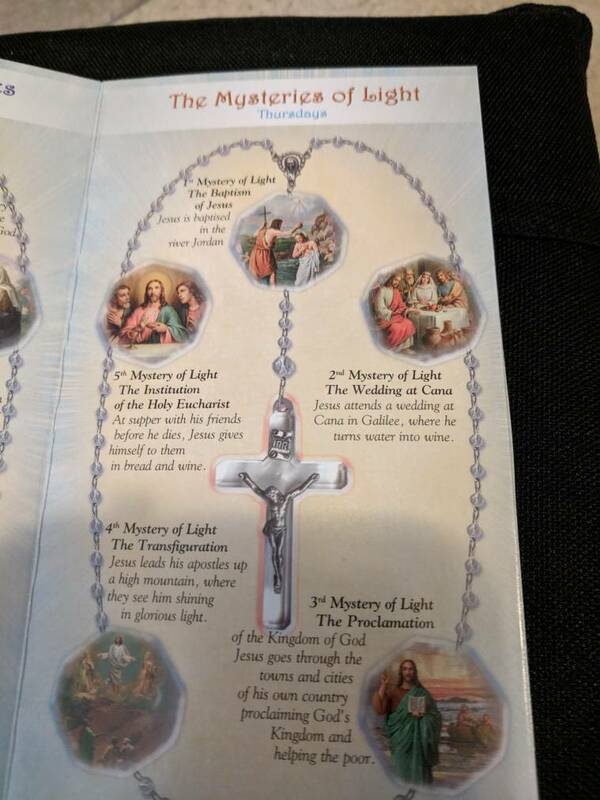 After exposing the praises and comments of many Popes, as well as referring to the indulgences and blessings they gave for praying the traditional Rosary, it seems quite clear that to pray a different rosary of four sets of mysteries causes this rosary to lose the merit of those eulogies and blessings. In other words, whosoever prays the new sets of mysteries would seem not to benefit from the previous indulgences and graces. In summary, far from being a benefit, this new set of Luminous Mysteries caused a serious damage. It subverted an august 800-year-old devotional practice. Adding an additional 50 Hail Marys was an extravagance that did not lead more persons to adopt the practice of the Rosary; it made it more difficult for those who already prayed it. This addition of John Paul II, introduced on a personal whim, seems to me a hypertrophy that is producing an atrophy in the devotion of the Rosary. I wonder whether this atrophy was actually intended to sabotage the Rosary devotion. I hope JP II's intentions were good.